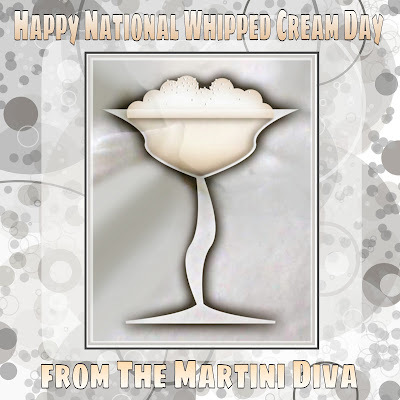 Celebrate National Whipped Cream Day with this Whipped Cream Martini, a cocktail that features whipped cream flavored vodka. I've used both Pinnacle's Whipped Cream Vodka and Smirnoff's Whipped Cream Vodka and both will work in this cocktail. I've seen rumblings lately from Beam Suntory that they will be discontinuing some of their Pinnacle flavored vodkas and hope the Whipped Cream is not among them. As mentioned in my review of Pinnacle's Whipped Cream, this is a surprisingly good flavored vodka which tastes like actual whipped cream. It's a richer, creamy alternative to vanilla vodka and I keep it on hand expressly for this reason. It made my job pretty easy when creating this martini, though I did add a tiny splash of Irish Cream for a slightly deeper flavor profile. Shake ingredients until chilled, top off with whipped cream dusted with sprinkles and serve. This is a very sweet drink, but then, if you're looking for a whipped cream cocktail, you're probably liking that. If you want to tone down the sweetness add a few dashes of your favorite bitters, chocolate or coffee bitters are both great in this cocktail.